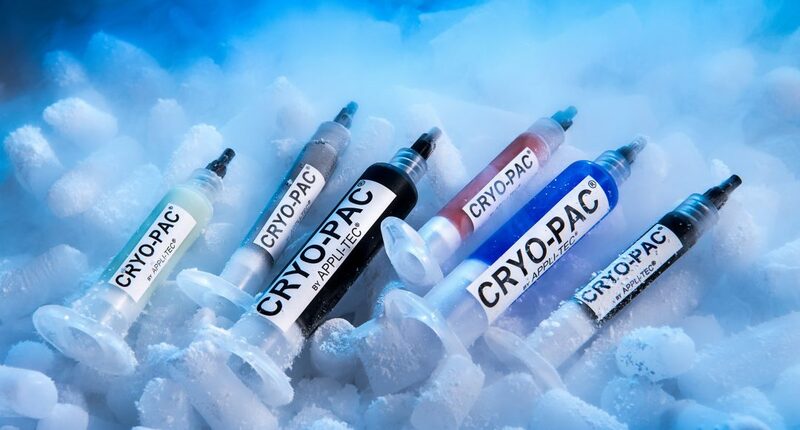 Cryo-Pac – Appli-Tec’s line of pre-mixed and frozen adhesives. Appli-Tec flash freezes syringes and cartridges to <-40°C as soon as they’re manufactured. Adhesive products are either stored in our cryogenic freezers or shipped to you under dry ice in insulated boxes. Upon receipt of your Appli-Tec PMF adhesives, immediately check the indicator tube in the box. If it has melted, please call Appli-Tec immediately at 603-685-0500. If the indicator tube has not melted, adhesive products should be transferred immediately to <-40°C storage to ensure maximum shelf life. Please check the Certificate of Compliance and the label for the proper storage condition. Wear insulated gloves when handling frozen adhesives, otherwise freeze/thaw voids can result from handling the syringes with your bare hands. Syringes and cartridges must be maintained at <-40°C. Please check the Certificate of Compliance and the label for the proper storage condition. Be sure to use thermal protective gloves and PPE. Always review the SDS and caution statements before using product. Remove the syringe from the freezer. When handling the frozen syringe, avoid touching the barrel. Instead hold the syringe by the tip cap or the ears. To thaw the syringe, place the syringe vertically, with the tip pointing up at room temperature. This will allow air bubbles in the syringe to accumulate in the tip of the syringe, which makes the air easy to bleed out before attaching a needle. Increased air circulation, such as a fan, will cause the syringe to thaw faster. If thawing in a water bath, place the syringe in a sealed bag to prevent the water from coming into direct contact with the syringe. Wipe off any condensation that may have formed on the outside of the syringe with a fiber free cloth before use. If the condensation reforms, or the tube feels cold to the touch, then you need to allow the tube to thaw for additional time. The syringe should be ready to use between 17°C and 20°C. If you try to use the material cold, you risk introducing moisture into the material. We recommend the 17°C to 20°C temperature range because it is well above the dew point at most manufacturing environments. DO NOT thaw the syringe in your hand. DO NOT thaw the syringe with heat, such as a hair dryer, heat gun or in an oven. Thawing syringes quickly will introduce freeze thaw air voids. The thaw time will vary depending on the size of syringe, the thermal conductivity of the material, and ambient conditions in the area. Typically a 3cc syringe will take approximately 10-15 minutes to thaw, and a 30cc syringe may take up to 30-40 minutes to thaw. A consistent thaw process will optimize your yield.